RK Narayan, or Rasipuram Krishnaswami Iyer Narayanaswami, is widely hailed as one of the greatest and most popular authors in Indian literature. His trademark pithy but elegant style had a lot to do with introducing this very genre to the rest of the world. No ode to R. K. Narayan would be complete without at least a brief mention of Malgudi, the streets and alleys of which are as familiar to a Narayan fan as the secret passages of Hogwarts are to a Potterhead! Almost all of his works are set in this fictional town, which is supposed to be imagined along the lines of Bangalore (as deduced from one of his writings). Narayan was one of the most intelligent authors of his age; the Malgudi in his books is shown to be a dynamic entity – the town we read of in his debut novel (1935) is noticeably different from that in his last fictional work, The World of Nagaraj (1990). R.K. Narayan passed away in 2001, at the age of 94. As with all great artists, his legacy lives on in his breathtakingly simple yet beautiful stories. We bring to you a roundup of Narayan’s top 10 works that are not to be missed! 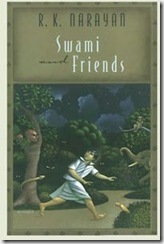 The theme of this book seems deceptively simple – the everyday trials and tribulations of a young boy who attends the Albert Mission School in Malgudi. The genius of this writer lies in how he manages to make this, a fairly straightforward story told from a 10-year-old’s point of view, into one of the most beloved and highly acclaimed stories of our time. The appeal of this work lies in the minute details and descriptions that transport you back to a different place and time. Buy this book at the best price! The second in a trilogy of autobiographical books, The Bachelor of Arts takes us to Malgudi from a college student’s perspective. It takes us through the journey of Chandran’s graduation, a love affair and the cost of its subsequent failure on an adolescent mind still not fully formed. 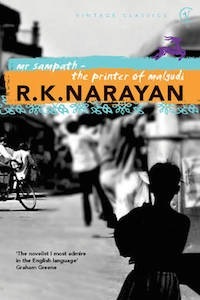 This novel is definitely darker in tone than its predecessor, Swami and Friends, and gives the reader a glimpse of the Madras (Chennai) of a bygone era. 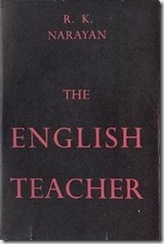 Arguably the most tragic of all Narayan’s works, The English Teacher is also the most personal of his stories. This book is dedicated to his wife and the events that transpire are, in essence, Narayan’s own experiences of personal loss and survival. This is also my personal favorite of the Narayan collection; it has a certain raw edge and disarming honesty to it that distinguishes it from most of his other polished, nuanced works. The Guide was the most highly publicized of Narayan’s books – ask that generation of avid moviegoers about the Dev Anand- Waheeda Rehman starrer and watch their response! This is the story of a happy-go-lucky young man’s infatuation and overpowering obsession with a little-known dancer by the name of Rosie and how this obsession enables him to make her a national celebrity, Nalini. And what does he get at the end? A life of loneliness and (maybe?) spiritual renunciation. 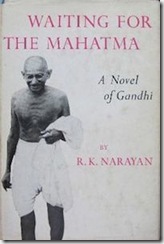 This is one of the few books written in the post-Independence years that has the Mahatma himself as a character. This novel narrates the love story of Sriram and Bharati, as set against the nationalist movement during the struggle for Indian independence with all the political controversies, morchas and charkhas associated with Gandhi-ism. The pinnacle of this plot is undoubtedly its climax, which manages to give new sentiment to a now-famous historic event. 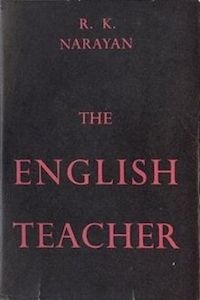 Read this one for its unsentimental literary portrayal of Gandhi (a minor but important character in the novel), which might make you view the Mahatma in a different, more human light. Buy this book at the best price! 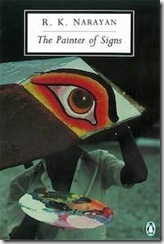 The Painter of Signs gives us a panoramic view of Malgudi through the medium of Raman, the signboard painter of the town. 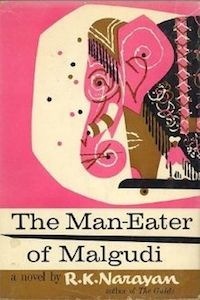 Raman lives with his elderly and devout aunt, and his world goes topsy-turvy when (of course) a young woman (Daisy) arrives in Malgudi on a mission of introducing the citizens of the town and all its surrounding villages to the then-unknown concept of birth control and family planning. The rest of the plot follows the somewhat hilarious-yet-ultimately-doomed relationship between Raman and Daisy, with yet another brilliant twist ending from Narayan. Buy this book at the best price! 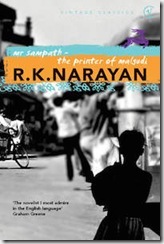 Mr. Sampath was the only Narayan novel to be made into a movie script with the direct collaboration of R.K.Narayan himself. This is a fairly simple storyline, set in a newly formed movie studio in Malgudi. (I told you Malgudi changes with the times!) The title character, Mr. Sampath, is a printer-turned-filmmaker who has the misfortune to fall in love with the lead actress of the in-production movie – while supporting a wife and numerous children! The characters of Sampath and Srinivas provide a wonderful contrast, and in true Narayan style, the devil is in the detail. 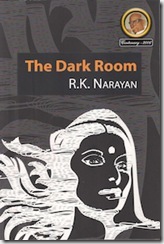 This novel is unusual in that it is the only one of Narayan’s books to show the world from a woman’s perspective. While making his readers smile with his acute observations of human foibles, petty insecurities and small joys, Narayan does not neglect the murkier aspects of life. Savitri, the inhabitant of the titular ‘dark room’, is a typical South Indian Brahmin wife and mother, who runs a well-managed and smooth household for the benefit of her husband Ramani and three children. The dark room (an unused room in the house) is her only refuge when contending with various problems in her marital life, courtesy her pompous, uncompromising husband. The plotline traces what happens when Ramani has an affair and Savitri undertakes her own personal journey of despair, emancipation and finally, resignation. Buy this book at the best price! 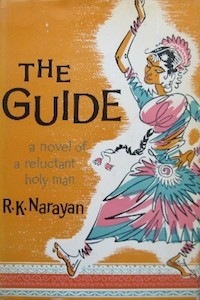 This is Narayan’s most popular novel and also his most critically acclaimed one, and is often included in the syllabus of literature students across the country. A typical rags-to-riches story, it centres on the journey of Margayya, who amasses riches and repute by means of his wiles alone. One thing leads to another, however, and he suddenly faces a sullen, disobedient and spoiled son along with the looming prospect of losing his hard-earned business. It is said that many great stories begin with the entrance of a stranger to the town, and The Man Eater of Malgudi follows this pattern. 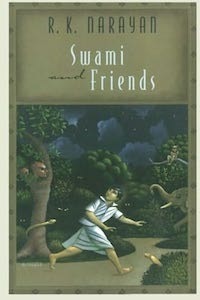 Vasu, a taxidermist, is a stranger to Malgudi, who seems intent on creating havoc and discord wherever he walks and recognizes no laws except his own (like the mythical asuras). The peace-loving, non-confrontational Malgudians are at a loss as to how to deal with this loudmouthed bully. The means by which this threat to the the town is finally neutralised is a superb tribute, (tongue-in-cheek of course), to the best traditions of Indian mythological narratives. No reader should miss the section where Malgudi is shown in its full glory during the temple festival, which is also the scene for the thrilling climax of this novel. Buy this book at the best price! The one unifying factor that binds together all of these diverse plots and narratives is the gift of Narayan’s storytelling – so vivid that his characters and universe become a part of you. 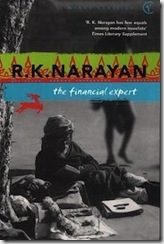 A typical Narayan book will engage, amuse, gently pontificate and leave your soul just a bit richer for the reading! 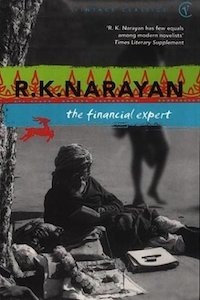 Are you a fan of RK Narayan’s work? Which is your favourite book? Tell us! 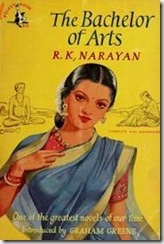 Which is your favourite RK Narayan book, Maniparna?